Celestron’s Moon Filter is an economical eyepiece filter for reducing the brightness of the Moon and improving contrast, so greater detail can be observed on the lunar surface. The clear aperture is 21mm and the transmission is about 18%. This makes the filter ideal for virtually any aperture telescope making the view of the Moon far easier on the eye and helping preserve dark adaption. 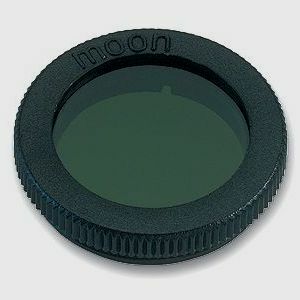 This filter simply threads into the standard filter thread of 1.25" eyepieces and accessories.